If you search your ancestors in Termini Imerese, Sicilia, info about your Italian family are stored in the City Office archives or at the parishes. In towns and villages of Sicilia and in Palermo province registry offices were established around 1820: it means that you could find information in Termini Imerese registrar as of that date. So, if your ancestors were in Termini Imerese in the nineteenth or twentieth century, then you could try to contact the City Office of Termini Imerese to know more. Before to start your genealogy research in Termini Imerese, we suggest you to read our tips for your search . They are useful to search in sicilia and in Termini Imerese too. 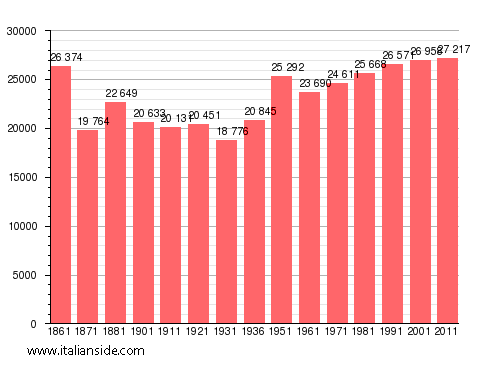 Next picture shows the demographic trends in Termini Imerese from the Italian Unification (1861) an important info to understand how many people lived there in the past. It could be important to know if the last name you are investigating is a frequent surname in Termini Imerese. As more your surname is common in Termini Imerese, as more it could be difficult to find the right info about your ancestors in Termini Imerese archives if you have not exact dates. If you have the opportunity to visit Termini Imerese and Palermo province, you could plan to investigate churches’ archives by yourself (or with us! ), but from abroad is very difficult to obtain any result unless you find a reliable local help. If you have the opportunity to visit Termini Imerese and Palermo province, you could plan to investigate churches’ archives by yourself, but from abroad is very difficult to obtain any result unless you find a reliable local help. If your research is in a dead end and you need professional help from our local Italian genealogists write to terminiimerese@italianside.com our expert in Termini Imerese area will study your request and will reply to you with a research plan and a quote. I was adopted at 2 months old but am now in reuinion with my biological family, slowly learning about my roots, and trying to build a family tree. I am currently researching ancestors from Termini Imerese. Surnames that I’ve found so far include Rizzo, Rea (or Re), Navarra, Gugliemino, and Russo. Noticed a couple of these repeated by others, maybe we’re related! My cousins and I are traveling to Termini Imerese June 2019 and we would love to meet any relatives. Our Grandfather, Salvatore Crisanti I migrated to Chicago I believe in the 1910’s. He traveled back and forth several times to bring different family members back to Chicago. He and his brother ran a fruit distributing business in Chicago for many years. Any help would be greatly appreciated. I’m looking to connect with the Spicuzza families in Termini Immerse as I am planning a trip there next year. Hi my name is Regan Caponi, son of Filipo Capone. His father was Antonino Capone and his father was Carmelo (Agostino) Capone. His father was Filipo Capone. All of them are from Termini Emerese. Filipo(my father) was named after my great great granfather from Termini Emerese. I also just got back from Termini Emerese last october, and I acquired all of their birth certificates. Also,I have my grandfather Antonio Capones obituary from the paper and the Bovas were mentioned as a family present at the funeral. I have a lot of information and it sounds like we may be cousins. I live in San Francisco. Do you have relatives in Iowa and Sandusky, Ohio? My family immigrated from Sicily to Chicago originally. Feel free to google me and you can find my number. We are travelling back to Sicily again, it was a great trip. I am researching the genealogy for the Schiavo family and looking for information on John Schiavo. Please help! My great-great-grandmother was a Di Domenico. She was born Rosa Di Domenico in Termini Imerese in 1866. She immigrated to the US in the 1890s with her husband Giuseppe Russo. They settled in Louisville, Kentucky. Both of their sons, Joseph and my great grandfather Anthony Russo worked in the fruit wholesaling business in Louisville. I have traced her Di Domenico line back several generations: her father Giuseppe (1822-1906), her grandfather Paolo Di Domenico (1797-1880), her great-grandfather Bartolomeo Do Domenico (1748-1826), and great-great grandfather Antonino Di Domenico. All were from Termini Imerese. I am doing a little family research and I see that I have a lot of the common names in my tree. One of the names (the one closest to me) is not in your list of common names so perhaps you can help. My mother was Lee Anne Panzica, her father was Fierende Panzica (both born in the US), his parents were Agostino Panzica and Maria Butera, both born there… and then extending outwards but always in the same place in Termini Imerese. Any information you can provide on this family is greatly appreciated. La mia grande, grande, grande nonna è nata a Palermo circa 1881, Marianna gentile. Sposato Anthony Brucato, anche di Palermo, ed emigrato a noi sulla TSS Martha Washington 1909. Alla ricerca di qualsiasi famiglia ancora a Palermo, i loro certificati di nascita e di licenza o matrimonio. I am looking for information on my grandfather, Antonino Badali. He immigrated to the U.S. (Chicago) in 1898 and was born in approx 1884. He married Antonia Palumbo in Chicago in 1910.I am traveling to Sicily in June, 2018 and would love to be able to meet relatives there. Deborah, I have been looking for information on possible Badali relatives. We know that our grandmother’s step-mom ( may be biological mom), born Agostina Maria Concetta Rub(b)ino married a Francesco Badali in Termini Imerese and had at least one son who emigrated to the US. His sister emigrated as well. They both lived in Chicago. I wonder if this is the same Badali family. I’m on a public computer at this time and don’t have my genealogy research with me,and can’t remember the name of Agostina and Francesco’s son, so I will try to contact you via this website again later today. Just stumbled on this site. Are you seriously a Nick Bova and Augustina Capone descendant? They are my great great grandparents. I live in Iowa. Debbie here again, Antonino Capone son of Filippo married to Antonia Vallelonga. Looking for info on my maternal great great grandparents, Joseph 12-24-1869 and Rose 5-20-1867. I have been told that they were from Termini. Any help is appreciated. Someone translated my GrGr Grandfathers birth as following:(but I am trying to figure out the neighborhood name Castile Iasella. Could that be correct. Does not show on a map as far as I can tell. Is there another way to find out where exactly they lived? Birth #463, recorded 15 July 1872 at the town hall of Termini Imerese: appeared Michele Pace (son of deceased Giuseppe) age 40, a blacksmith, who presented a male infant born the 14th of the current month at the hour of 9 to his wife Agostina D’Amico (daughter of Agostino), age 32, living together in this town at quartiere Castile Iasella, and he further said the infant was given the name Agostino Pace. My family came from Termini Imerese and their surnames are AIELLO and CALCATERRA. We are from of the mariage between Antonino AIELLO and Maria Anna CALCATERRA. Their childrens are Francesco-Paolo; Maria-Grazia; Rosa. We need to know their birth day and the others dates about the couple. We ignore when they are married, when they are died. If somebody is a member of this genealogy so don’t hesitate to contact us! I traced Margaret Cosentino’s line, through the Longos, all the way back to the mid 1700s, to Ignazio Dentici and Maria Marfisi who had Giuseppe Dentici in 1776 and Francesco Vitale and Antonina Russo who had Antonina Vitale in 1785. Everyone was from Termini Imerese! I am related to Antonio and Maria Arena Mantia, Ignazio and Carmela Martino Longo, and Lawrence and Camilla Longo Cosentino. Lawrence, my great-great grandfather, emigrated to the U.S. in 1884. I had trouble tracing Cosentinos back further. His son Joseph was a fruit vendor. I hope to travel there sometime. Were they related to the Cosentino’s in Oswego, NY? My great-grandmother was Agostina Cosentino. She was born in Termini Imerese in 1860 and married Antonino Quattrocchi. They then immigrated to USA and settled in Chicago. She had seven siblings who settled in Chicago, New Rochelle NY and Providence RI. Her parents were Domenico Cosentino and Maria Ippolito. All of the Cosentinos who came to America were in the fruit vending business too. I wonder if your Cosentino relation is in the same family as mine? Hello… I am searching for the Franze family of Termini Imerese, specifically, the family of Guiseppe Franze (B 5 Dec 1885) and Francesca Lacavera (B 2 Nov 1893)who immigrated to Albany, NY in 1902. Giuseppe Franze was the son of Francesco Franze (Marianna Amodeo), son of Giuseppe Franze (Providenza Battaglia), son of Cosimo Franze and Agostina Piazza. ANY information would be greatly appreciated! I am researching ancestors from Termini Imerese. Some of the surnames include Spicuzza, Mascari, Cianciolo, Spalla, Pusateri, and Russo. I’d love to hear from anyone researching the same groups! I am just starting my research on the Spalla & Schillaci families. I have an old photo from some of my relatives from the Schillaci family in front of their home in Termini. I’m just starting to research and track down records for the Pusateri family. Did you have any luck researching that line? I knew a Father Snyhony Spicuzza a priest from Indianapolis. There are also Madcaris in Indytoo! My husband’s family came from Termini Imerese to Chicago. His great grandfather, Pietro, was in the fruit business. My father’s family is from Termini Imerese. Dad has always wanted to go to Italy and walk the streets his grandfather and father walked but has now become too ill to make it happen. I was hoping to bring a little piece of history to him. 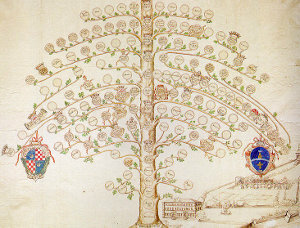 How would I go about obtaining a family tree document from Termini Imerese and is there anything additional I can do/buy that would add to it? Thank you in advance. Looking for all info for my grandfather Anthony Capone. Or Caponi. Please hail me I am coming to termini in 2017. I would love any information anyone has about the Arrigo’s from Termini and ended up in Evansville,Indiana. My Great grandfather was known as Giuseppe or Joseph Arrigo. He had other relatives that ended up in Michigan. Near Detroit I believe. Joseph was a fruit vendor. Planning on trip to Termini Immerse (TI) in May, 2017. Have Church records on paternal and maternal great grandparents and older from Church database. Would like to know if City records can give street addresses in TI and if you can find and set up day tour for wife and me in May 2017? There was an Agostino Maria Emanuele LaCavera born 01 Aug 1885. I am looking for information on my Great Grandfather His name was Antonino Grasso (Graso) I know he is from sicily and born around 1864. I found info on a great Uncle that listed he was born in Termini Imerese Oct 9, 1889. I know my great grandfather came to America had 2 more children and went back to Sicily. He was Married to Providenza Anselmo (Anzelmo). Thanks for any information I can recieve. Looking for info on my great grandparents and anything else I can find. My grandfather was born in Termini Imerese I believe. His name was William Marion Sgarlata – and was born in February 1884. He came thru Ellis island as a child sometime between age 2 and 12. I believe my great grandfather’ name was August Marion Sgarlata. I understand I have distant relatives living there now. Can you help me?? I’m looking for the parents og Michael Mercurio. He was married to Maria Cianciolo around 1852 in Termini Imerese. Micheal immigrated to the US in the 20th century, in Cleveland, Ohio. I am also looking for any relatives living in Termini Imerese. My dad came too New York when he was 6 years old, Giovanni Mercurio. Probably around 1900. Please let me know if you’ve had any luck. Seriously thinking about a trip there this year. April 27, 1892. He was sponsored by Pietro LoBello from Syracuse, NY. (We think Pietro was his cousin). I am about to meet Frank LoBello, Syracuse, NY., who is Pietro’s great grandson. He is the oldest of 6 kids and was born and raised in Syracuse. My family has has done our LoBello genealogy but the branch with Vincenzo and Vincenina LoBello has no other information, other than being my grandfather, Joseph Vincent LoBello”s parents. Thank you. Looking for confirmation and any other information about my great grandfather, Agostino Gattuso married to Maria Cornella, lived in either Termini Imerese or Palermo. A son, Augustus Gattuso, my grandfather, was born Oct. 16, 1879, in Termini Imerese. My family says they were Aristocrats, Agostino Gattuso owned olive orchards, and was mayor of Palermo sometime during the latter half of the 1800’s. Very interested to learn if these facts are accurate and any other information you may obtain. Thank you. Is there any way I can find information regarding Anna Maria Gentile? My mother’s maternal and paternal lines are all from Termini-Imerese. The names are Mantia, Russo, Corso, Mancuso, Catalano, Cosentino, Trentanella, Schillaci. Am researching to find the Termini-Imerese “Russo” family with a long history of puppeteers and Marionette performers going all the way back to doing performances for the King of Sicily. The Corso line including Salvatore Corso and Leonardo,his son, were workers at a Termini-Imerese Inn and Leonardo’s daughter Carmella Corso Russo (1851-1940) told my mother and aunt many stories of the coming of Napoleon’s soldiers, told to her by her father and grandfather. There was also a coin, a French 5 Franc piece handed down, long since lost and the story behind the coin has also been lost. The Mantia line were originally from Palermo and at some point moved to Termini-Imerese where they were merchants mainly involved with seafood. Carmella and her husabnd Fillipo Russo immigrated to the United States, to St. Louis, in 1885, then lived in Kansas City where my grandmother Providenza Russo Lamantia (1888-1933) was born, and later lived in Hartford, Conn. and then Providence Rhode Island where I was born. Thank you for this wonderful website! I am searching to find my grandparent’s parents. Specifically, I am looking for the parents of Giuseppe Mangione, born in Termini Imerese in 27 Apr 1894. Also, the parents of Filippo (or Fillipo) La Mantia, born in Termini Imerse 18 Jan 1886 (grandmother’s brother). Thank you for your help! I am looking for my Italian relatives. My grandmother and grandfather came from Palermo and surnames were Mantia and Ciriminna. So excited to be visiting Termini Imerese in the fall. I have ancestors dating back to the late 1700’s which I have identified thanks to the T.I. database. Is there anything beyond that I can hope to accomplish during my visit? What do you recommend I do, geneologically speaking or otherwise? Should we avoid coming on a Sunday since the city hall will be closed or wouldn’t we find anything new there since we have access to the database? Thank you for any suggestions. My grandfather Giuseppe Mercurio (birth Aug 17, 1868) and Grandmother Maria Gaglione(birth Oct 12, 1876)were born and married (June 3, 1893) in Termini Imerese. I have some information regarding their ancestor an would like to gain more detail for the years 1700- 1868). Much of the family on both sides immigrated to US. I have already visited Termini Imerese several times and will be coming again in August 2015 and would like to locate the homes and parishes that both grandparents lived in before immigrating. Also any information on Carl Griffo as I think he is from the region as well. Hello. My grandfather Victor purpura. His family was from the same area. I’m looking for whatever I can find about where I come from. I have been attempting to find my Great-Great-Grandfather’s (Charles Leonardo or Leonardo Charles Mormino) Italian Birth Certificate. According to his Declaration of Intent and his 1935 Death Certificate he was born in Termini Imerese in about 1887. His parent’s names may have been Carmen and Rosalia. I have looked through the microfilm for the Termini births from 1880 to 1891 with no success. Is there somewhere else I should be looking? I am looking for the marriage record of Santo Sasso (born March 1901 in Termine Emerese and died January 1982 in Chicago) to Marianna Bova (born April 1904 in Sicily and died April 1988 in Illinois). I believe the marriage took place in 1920. There may be another court document in 1920 or 1921. Ancestry does not seem to have documents from Sicily. Can you help me? I have reason to believe my grandfather was born in Termini. His name was Francesco Mercurio, he was born on January 5th, 1892. His fathers name was Giovanni and his mother was Santa. He had three sisters Mary, Jenny and Polly, and two brothers Salvatore( born July 21st)and Pete, all could be Americanized except Salvatore. Also I have reason to believe Francesco wife Guiseppina Sciano (my grandmother) might have been born there as well. Her Fathers name was Biago Sciano and her mothers name was Antonia (maiden name Armaro)She had sisters Maria and Jennie and brothers Jim, Sam, Fred and Tom. I am searching my Mascari line I have been able to go back to Saverio Mascari 1700’s married to Giuseppe Catalano and there child is Matteo Mascari wife Paola. Any help from any one searching the Mascari I would love to go back Further back. Looking for help. Looking for information on Papania family. This sounds very interesting thank for the information. How can i contact you to learn more about this? I would be very grateful if you would kindly share your sources. thanks! Salvatore and Benedetta are my great grandparentsi was looking for more information and came across your request. I have info going forward from those two but not back. Emigrated in late March 1912, sailing from the port of Palermo on the Saxonia. The ship arrived in New York 9 April 1912. Salvatore LOCOCO and Giovanna ____? They were also Sicilian and very likely from Termini Imerese. Salvatore LOCOCO: born 1863/4. Emigrated in 1887. Returned to homeland in 1893 and married Giovanna ____. They sailed from Naples on the ship Kronprinz Friedrich Wilhelm and arrived in New York 26 May 1893. Both the Giunta and Lococo families settled permanently in Lincoln, Lancaster County, Nebraska, U.S.A.
Any help which your might offer would be greatly appreciated. Thank you. A few of my ancestors from Termini-Imerese are my great great grandfather Rosario Gioia he married Maria Manuelle? His parents were Vincenzo Gioia/born 1833 wife was Giuseppa Pusateri born 1839. Vincenzo’s parents were Maria Giunta/Gesualdo Gioia. Giuseppe’s parents were Giuseppa Balfamanto/Giuseppe Pusateri. Not sure if you have info on Giuntas? I am familiar with Benna Guinta. She was a member of the Italian group here in Lincoln, Nebraska called the Daughters of Columbus. I have just stumbled across this site by accident. I will check with older members of this organization to see if they have any other information about Benna. My paternal grandmother was from Termini. SHE HAD THE MOST COMMON OF NAMES – MARIA BOVA. Is there any way to refine my search for her? If you would like to start a research in Termini Imerese please send your request to terminiimerese@italianside.com.